– Wegmans is coming and those on that side of Charlottesville won’t have to go to Barracks Road or Pantops or 29 North for groceries. 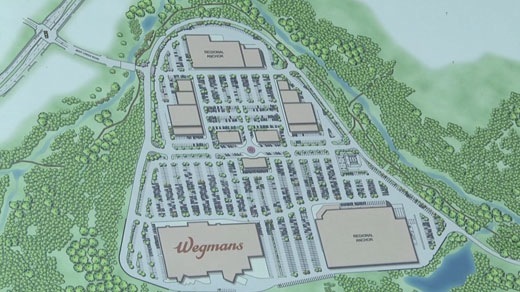 – The connector between Avon Street and 5th Street Extended will be opening to coincide with Wegmans’ opening. – Wegmans, Cracker Barrel and Target on 5th Street? – February 2012 – No to Target and probably no to Cracker Barrel. – 29 North? Where’s That? Said the Customers of Wegmans in Charlottesville – July 2012 – Costco won’t be going on 5th Street; it’s going to Stonefield. Jim, residents on that side of Charlottesville have two grocery stores, both Food Lions…5th Street and Mill Creek…maybe you mean “yuppie approved grocery stores”? Fair enough. I’ll clarify – grocery stores that are in higher demand. Many of the folks to whom I speak whose areas are served by the Food Lions tend to shop elsewhere. Hopefully the Food Lions will survive, but I’d wager at least one will close sooner rather than later. Latest article has them opening in 2016. I wonder if all the site pre-work has been pushing back the date? I saw that. I imagine the pre-site work has been challenging. Also, as I think the road is tied to the opening I wonder if that’s having an impact. I think the presite work is tied to the road opening, and yes, I think it’s all connected to the delay. From what I understand, the county has been helpful.